At the very beginning of the 20 Week Challenge I was supposed to create a Vision Board in my booklet. I left this page blank because I simply didn’t believe I would be able to achieve dramatic, positive change. Despite my uncertainty I was focused and committed from Day 1, which is good because on Day 2 it absolutely pissed down in Christchurch. But do you think that stopped me? No way! Not sticking to my exercise plan that early on was not an option…even if some of the puddles were nearing shin deep. Over the last 20 weeks I’ve exercised on 114 of the 140 days, sometimes more than once a day! I’ve achieved all my goals along the way. I completed the Sprint to the Finish as well as a personal challenge to exercise every day in July and to not weigh myself for that time either (a huge challenge for me!) 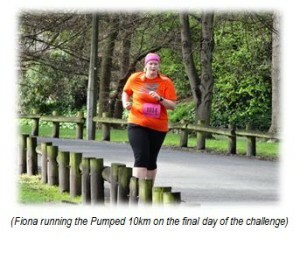 I have lost an extraordinary amount of weight and I’m now a runner. 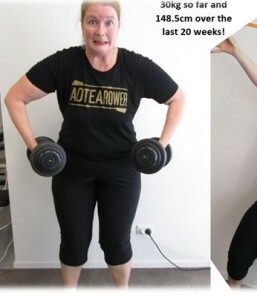 Before the Challenge I thought my 20 Week goal of running 3km non-stop was terribly audacious, and up until about the 10 week mark I was still convinced it was totally unreachable…but on the last day of the Challenge I ran 10km non-stop. WOW! Of the 20 Week Challenge Saturday Sessions, arranged by my PT Kate, I’ve missed only 2, once because of a prior commitment and once due to illness. Many of these sessions took place on big sets of stairs and I have earned a reputation in the group for powering up and down them. My personal best was 10 times up and down the St Martin’s stairs, that’s more than the Empire State Building (1872 steps, I did 2190)! I have enjoyed the 20 Week Challenge immensely and I’m amazed at myself and the things I have achieved. My lifestyle is completely different now; it’s so much better. I’ve got back a quality of life I hadn’t enjoyed for a long time. I’m enjoying shopping and socialising again. Going forward I intend to continue the practise of planning my week’s exercise and meals. And I have drawn a line in the sand: I will never again not be able to run 5km. ‘…I have admired your healthy relationship with food. Not once would I have considered you to be on a diet, to ever have been restrictive or limited to what you can and can’t have and because of that I believe that you have made a change that is realistic and you will stick to for life! Fiona you are such a hard worker when it comes to our training sessions, you always turn up smiling, you always give it all you’ve got and you never complain. You had this incredible determination at our group sessions that I just loved! 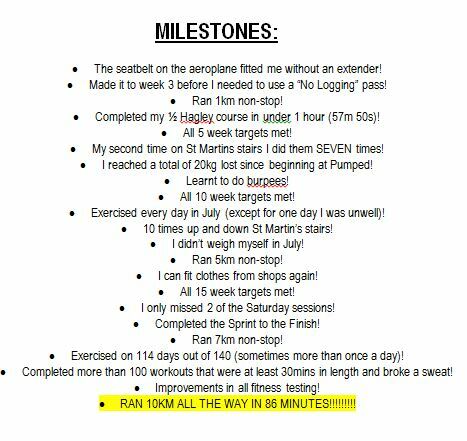 I loved how you would set yourself a goal of a certain amount of stairs that you wanted to beat from prior and you would always achieve this! You pack a mean punch and I love watching you at boxing classes. You are an inspiration to our other Pumped Athletes and they very much admire your hard work, success and drive! Thank you for being part of our family, for being the fun, happy and passionate one and for teaching others that they too can still have a healthy balance in life. Have a fabulous summer, keep smiling, keep having fun, enjoy every moment and I am excited to see what the future will bring.